When I was growing up in the 1980s, a photo of Pope John Paul II hung above many Irish fireplaces. That pope held a special place in Irish Catholics’ hearts, as he was the first and only pope ever to visit the country. He visited in 1979. There wasn’t another papal visit until this summer when Pope Francis came for the World Meeting of Families. He arrived in Dublin on Saturday, August 25th, and his first engagement was at Áras an Uachtaráin, where he was welcomed by President Michael D. Higgins. The president released a statement afterwards, striking what would become the tone of the pope’s entire visit. “President Higgins raised with his Holiness the immense suffering and hurt caused by abuse perpetrated by some within the Catholic Church. He spoke of the anger at what was perceived to be the impunity enjoyed by those who had the responsibility of bringing such abuses for action by the appropriate authorities and had not done so.” Yet there was light-heartedness too. Just as Pope John Paul II had done, Pope Francis planted an Irish oak on the lawn of the presidential residence. Visiting dignitaries planting trees here is a tradition older than the Irish State itself. Next was an official State reception at Dublin Castle. 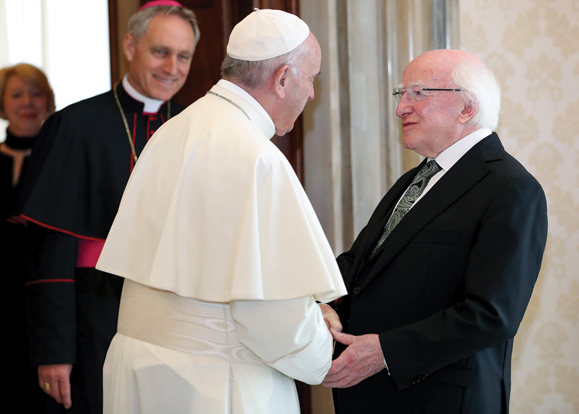 The Taoiseach reiterated the sentiments of the Irish president at this reception and the pope responded with the first of four apologies he was to utter over the weekend. He recognized that the Church’s failure to address abuse had given rise to anger, pain, and shame within the Catholic community, and admitted to sharing those sentiments himself. This third engagement was in St. Mary’s Pro-Cathedral, which is the episcopal seat of the Catholic Archbishop of Dublin and Primate of Ireland, but even here he couldn’t escape the shadow of abuse scandals. A Candle of Innocence has burned here since 2011 in memory of all victims of clerical and institutional abuse. Pope Francis said a silent prayer in front of it. Later that day, he had a private meeting with survivors of abuse. Among them were representatives of the Coalition of Mother and Baby Home Survivors, many of whose babies were forcibly removed from them and illegally adopted. Afterwards, they said that the pope had listened to their stories with genuine interest and apologized for the hurt they had suffered. Pope Francis’ final engagement on Saturday was the Feast of the Families Festival in Croke Park. This was a joyous affair, with 80,000 Catholics from all over the world singing and dancing together. Sunday started with a flight to Knock in County Mayo. It’s believed to have been the site of an apparition of the Virgin Mary in 1879 and the main reason Pope John Paul II timed his visit to Ireland for 1979 was to mark its centenary. The rain was pelting down in typically Irish fashion when Pope Francis landed. However, it didn’t dampen the enthusiasm of the local families, airport staff, and clergy who were waiting to welcome the pope to Knock. Back in Dublin, Pope Francis travelled to the Phoenix Park to say mass. This was to be the set piece of his entire visit. In 1979, 1.25 million people attended Pope John Paul II’s mass. However, only an estimated 130,000 turned out for Pope Francis. One of the reasons for this low attendance is the Say Nope to the Pope campaign, which block-booked some of the 500,000 tickets with no intention of attending the mass. These weren’t the only protests. A number took place across Ireland. The most popular was Stand4Truth. Writer Marian Keyes and singer Hozier were among the 1000 who congregated in Dublin’s Garden of Remembrance to stand in solidarity with victims of church-led abuse. Meanwhile, a silent vigil was held in Tuam, County Galway to remember the women and children who died in Ireland’s mother and baby homes. Pope Francis met with Irish bishops after the mass and then returned to Rome. The second papal visit to Ireland was over, having revealed much about Ireland’s relationship with the Catholic Church today. In 1979, few of us had any idea of the abuses being carried out and covered up by members of the Church. The institution was still held above all others, so much so that half the country turned out to catch a glimpse of the pope on his three-day visit. Today, Irish faith is in crisis. This was made clear by the contrast between us and those who had travelled from overseas for the World Meeting of Families. The foreigners expressed a joy in their faith that was missing from the subdued faces of Irish Catholics who looked battle-worn and weary from decades of being disappointed by their Church.